Every spring, white asparagus makes a brief appearance in most supermarkets. Although it’s been a European delicacy for a long time, white asparagus has lately also become popular in the U.S. So popular in fact, these porcelain-like spears are often hard to find. Like ramps and fiddleheads, they’re considered a rare spring delicacy. When they appear, they’re snatched up quickly. Be careful, if you blink, you just might miss them. 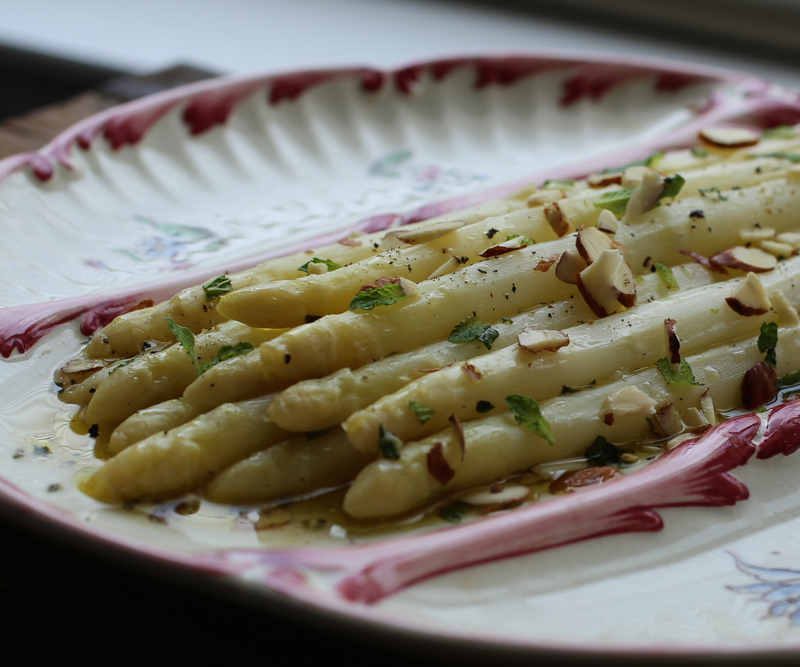 Slightly nutty, white asparagus is mild and less assertive in flavor than green asparagus. Aside from flavor, there is little difference between white and green—botanically they are the same—except the way the spears are harvested. White asparagus is grown in the dark, in complete sun deprivation. As their little heads stick up from the ground, dirt is mounded over them, keeping them in darkness and blocking the sun from producing the greening chlorophyll. Since no photosynthesis takes place, they never get a chance to turn green. This unusual harvesting method has led white asparagus to being nicknamed the vampire of the vegetable world. Cooking technique between white and green asparagus spears is also slightly different. Before cooking white spears, be sure to peel the bottom two-thirds of each spear because white asparagus tends to have a thick and bitter skin. 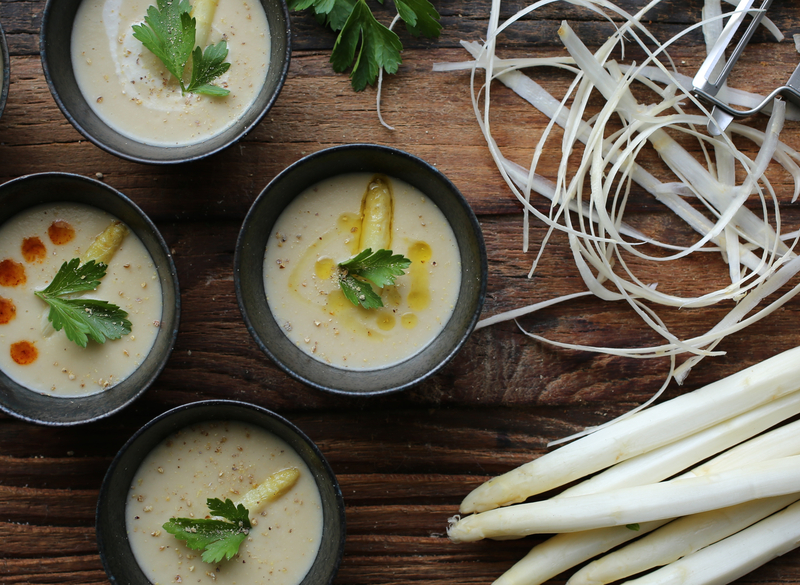 Boiling in salted water is the best technique for cooking white asparagus, but it’s also good roasted, grilled or in a deliciously creamy soup like this one. Trim and discard about ½-inch of the rough ends of the white asparagus. 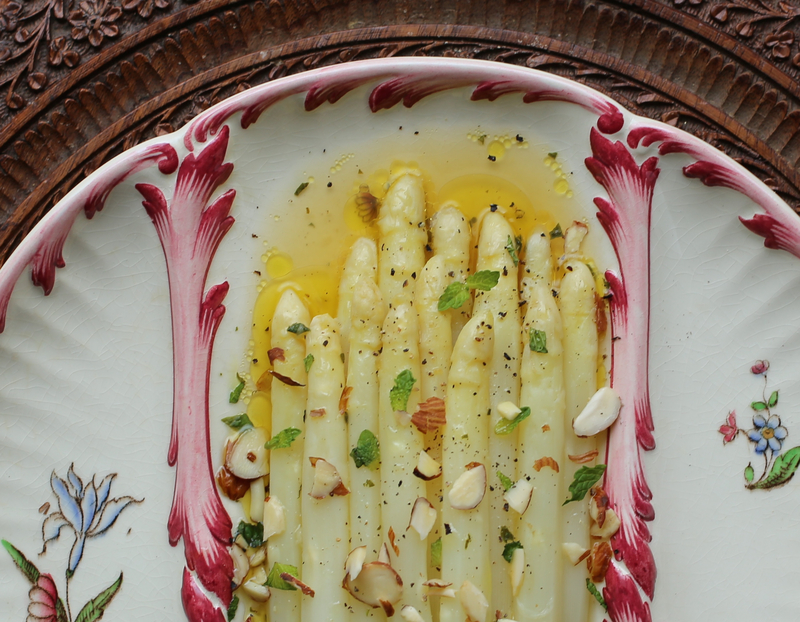 Cut off the asparagus tips and set aside. Lay the stems (spears) on a work surface as the spears can easily snap while peeling them. Using a vegetable peeler, peel the skin off the spears. In a large pot, heat olive oil over medium heat. Add the garlic and shallots and cook until fragrant, about 2 minutes. Add potatoes and ½ teaspoon salt and cook for another 2 minutes. Add asparagus (stems only, tips will be added later) and vegetable broth. Bring to a boil, then reduce heat. Allow the soup to simmer, covered, for about 20 minutes. Add the asparagus tips and simmer another 5 minutes. Carefully ladle the soup into a high-speed blender, like a Vita Mix, blend until smooth. Return soup to pot, add cashew cream and stir. Taste and adjust salt. In a small skillet, lightly sauté asparagus tips in olive oil for a few minutes. Remove from heat. To serve, ladle soup into bowls. Garnish with asparagus tips and parsley. Sprinkle with white pepper. Optional: drizzle with olive oil or you can mix olive oil with a bit of cayenne pepper and drizzle on top of soup. Trim about 1/2 inch of the rough ends of the white asparagus. Lay the spears on a work surface as the spears can easily snap while peeling them. Using a vegetable peeler, peel the skin off the spears, leaving the tips intact. In a large saucepan, add plenty of water and a generous pinch of salt salt and bring to a boil. Add asparagus, reduce heat and simmer until tender when pierced with the tip of a knife, about 10-20 minutes (it depends on thickness of spears). Spears should be tender and slightly crisp, not too soft. In a small bowl, whisk together the olive oil, garlic, balsamic vinegar, lemon and orange juices. Season with salt and pepper. Carefully remove asparagus spears from pan. Place them on a plate and drizzle with citrus vinaigrette. Garnish with chopped mint and almonds. 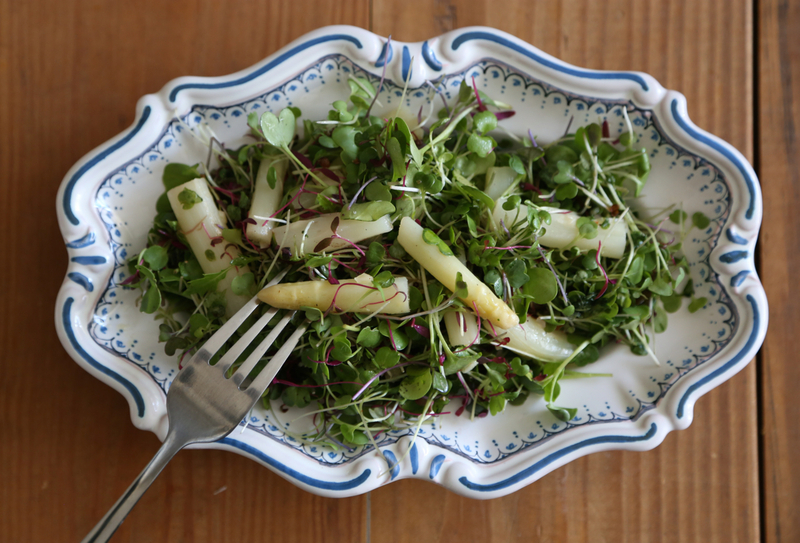 Alternatively, the spears in vinaigrette can be cut in thirds and mixed into a bed of micro greens, as below. 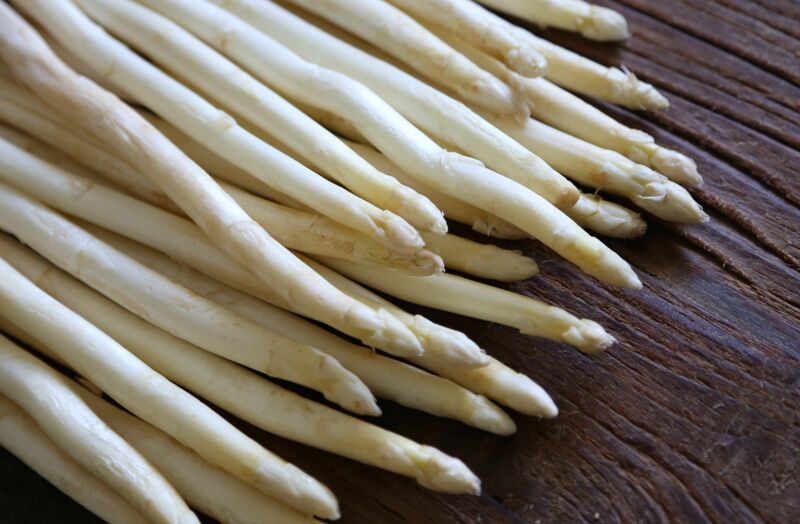 So the next time you’re at your local farmers market or the supermarket, keep an eye out for white asparagus. You might have better luck finding them at the supermarket. Since they’re commercially grown in South America and Europe and transported around the world, don’t be surprised if you notice that they’re more expensive than their green cousins. 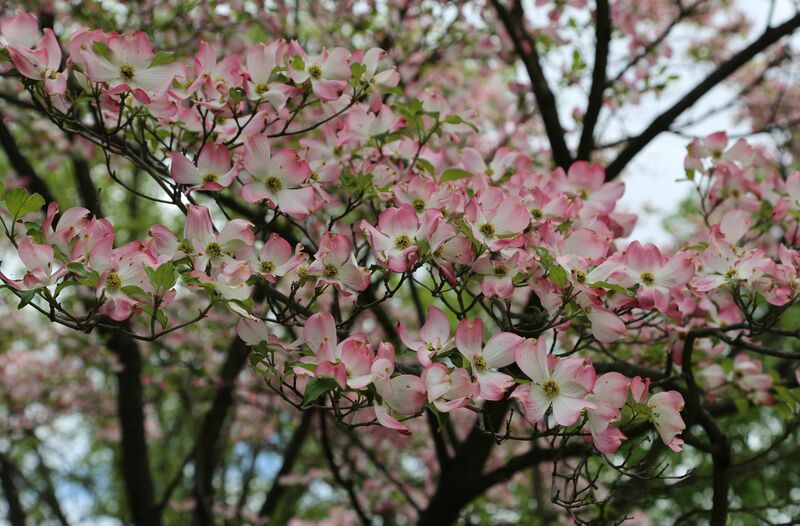 Thanks Shanna, this is now one of our favorite spring recipes! White or green, we all love asparagus too. I wish white asparagus was easier to find in the US. PS I am going to make your second recipe tonight! The asparagus in the citrus vinaigrette? Oh great. I should have also mentioned that I considered sautéeing it all which I’m sure would’ve worked nicely too. Especially to get the almonds a little toasted. I hope you like it. Feel free to tinker with the vinaigrette ingredients. Sometimes my husband prefers when I add more balsamic and sometimes with more mint or lemon. Enjoy and All the best! 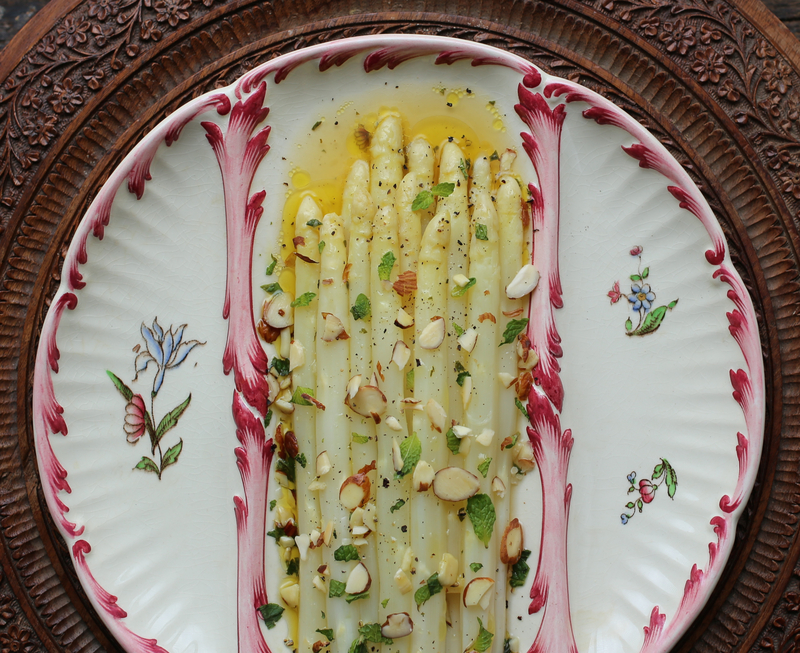 White asparagus is a little more challenging than the green to find, especially now that spring is coming to an end. But if you can find it, it’s definitely worth trying. If you do, don’t forget to peel the stems! Also, I once tried this soup with sweet potato instead of the regular white, YUM! It too was delicious! Enjoy! 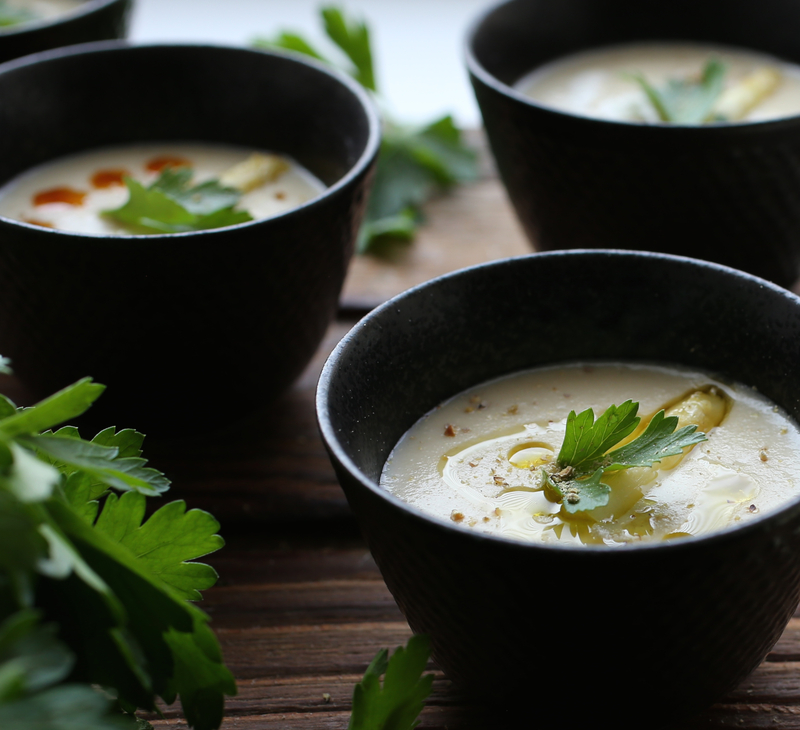 Another gorgeous asparagus soup. Beautiful take. Thanks for bringing it to the event :).